Paddling their way toward fitness. Walking in the underwater treadmill helps animals that have trouble walking on land because of arthritis, weakness, poor balance or coordination, painful joints, neurologic conditions, recent surgery or obesity. The water provides pets a supportive medium, allowing them to strengthen muscles and increase endurance with little compression on joints. For many post-surgical and neurologic patients, hydrotherapy is a great first step toward regaining a normal gait. And because water workouts involve every muscle group used in day to day movement minus the stress of walking on hard surfaces, hydrotherapy provides a great total body exercise, whether your dog is overweight a little or a lot, or in top athletic shape. 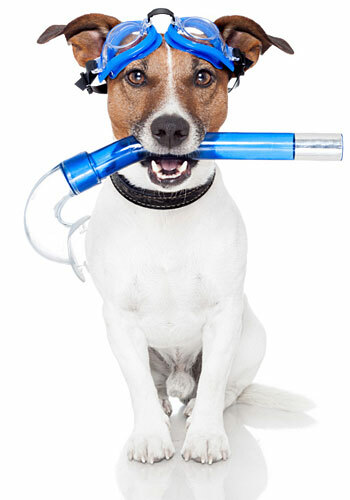 Aquatic exercise can help service pets, sporting pets, competition pets and loyal lap pets. Vet approval is required, however.